25-27 Commonwealth are located on the NE corner of Commonwealth and Berkeley, with 23 Commonwealth to the east, 282 Berkeley (29 Commonwealth) to the west, across Berkeley, the First Lutheran Church to the north, across Alley 422, and 48 Commonwealth (255 Berkeley) to the south, across Commonwealth. 25 and 27 Commonwealth were designed by Gridley J. F. Bryant and Arthur D. Gilman and built ca. 1861 for Samuel Hooper and his wife, Anne (Sturgis) Hooper. Samuel Hooper was a shipping merchant and real estate investor. He served as a US Congressman from 1861 until his death in 1875. 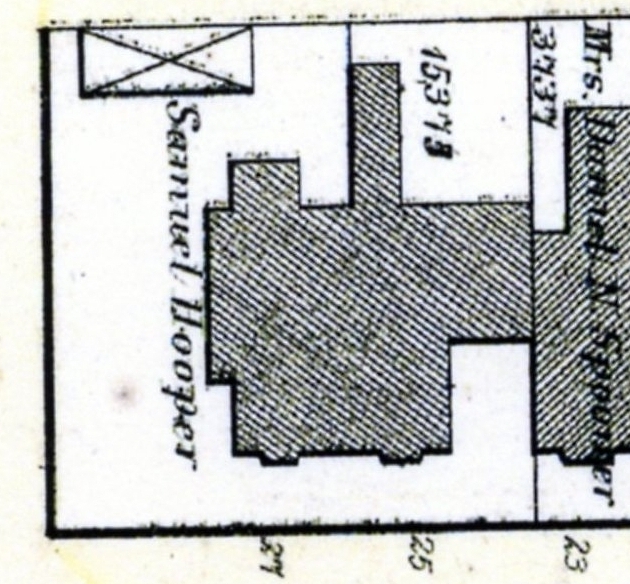 The land on which 25-27 Commonwealth were built was part of a larger tract of land purchased by Samuel Hooper from the Commonwealth of Massachusetts on May 2, 1860. 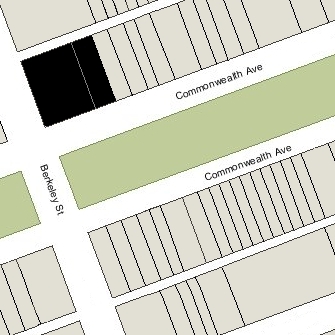 The tract extended west from the lot where 11 Commonwealth would be built to the corner of Commonwealth and Berkeley. 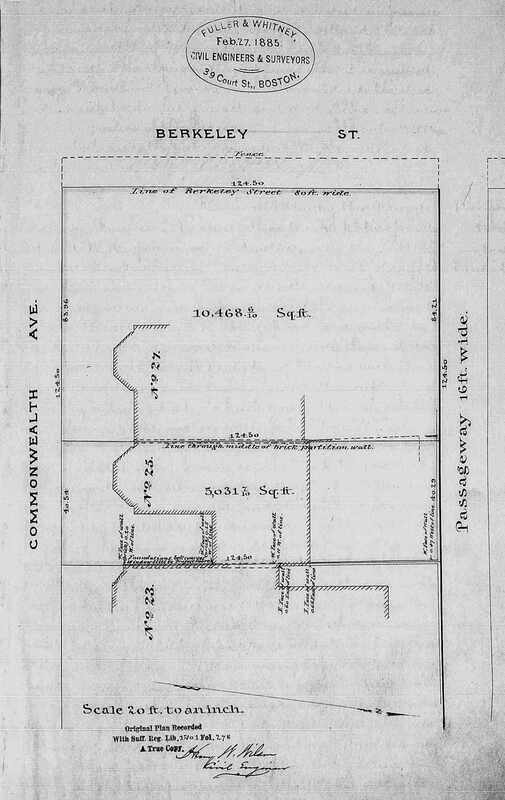 He retained a square lot at the corner, with a frontage of 124.5 feet on Commonwealth and on Berkeley, and sold the remainder (with a frontage of 210 feet on Commonwealth) on July 2, 1860, to four different buyers. Click here for indices to the deeds for 25 Commonwealth and 27 Commonwealth. After the houses were completed, Samuel and Anne Hooper lived at 27 Commonwealth, and their son and daughter-in-law, William Sturgis Hooper and Alice (Mason) Hooper, lived at 25 Commonwealth. Both properties were owned by Samuel Hooper. When they were built, 25-27 Commonwealth included a large brick stable at the northwest corner of the lot (the corner of Berkeley and Alley 422) which shows in earlier photographs and on the 1874 Hopkins map. It had been removed by the early 1880s, and in its place the 1883 and later Bromley maps show a long brick ell extending from the northern façade of 27 Commonwealth to the alley. William and Alice (Mason) Hooper lived at 25 Commonwealth from the time it was completed in about 1861. They previously had lived at 1 West Cedar. He was agent for the Bay State Iron Company. William Hooper died in September of 1863. Alice Hooper continued to live at 25 Commonwealth in 1865, and probably until she married again, in October of 1866, to US Senator Charles Sumner. Soon thereafter, 25 Commonwealth became the home of Samuel and Anne Hooper’s son-in-law and daughter, attorney Thornton Kirkland Lothrop and Anne Maria (Hooper) Lothrop. They had married in April of 1866 and 25 Commonwealth probably was their first home together. Samuel Hooper died in February of 1875. After his death, Anne (Sturgis) Hooper moved from 27 Commonwealth to 53 Beacon, and Thornton and Anne Lothrop moved to 27 Commonwealth. During the 1876-1877 winter season, 25 Commonwealth was the home of former China shipping merchant James Murray Forbes and his wife, Alice Frances (Bowditch) Forbes. 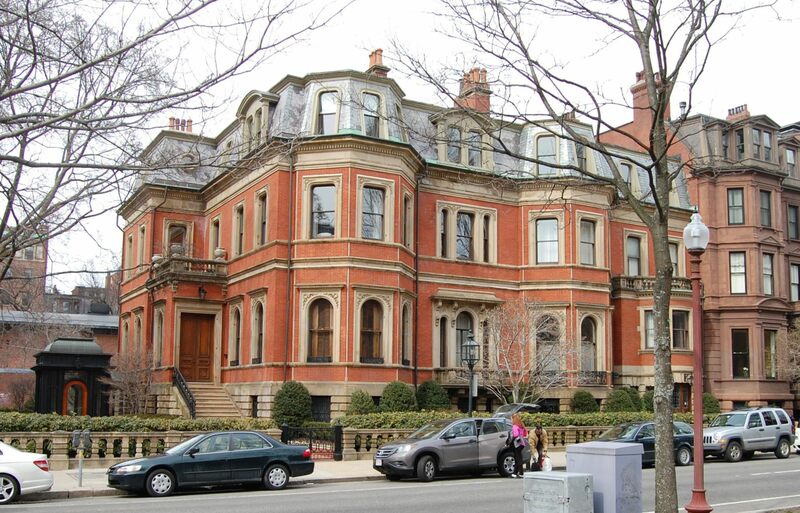 They also maintained a home in Milton (he previously had lived at the Somerset Club at 42 Beacon when in Boston). They had moved to 249 Berkeley by 1878. By the 1878-1879 winter season, 25 Commonwealth was the home of Martha Mansfield (Shepard) Silsbee, the widow of Salem merchant John Boardman Silsbee. She had lived at 256 Beacon in 1876. She also maintained a home in Beverly. She continued to live at 25 Commonwealth during the 1882-1883 season, but moved thereafter was living at 117 Beacon by the 1884-1885 season. 25 Commonwealth was not listed in the 1884-1886 Blue Books. As originally built ca. 1861, the eastern half of 25 Commonwealth was significantly recessed, creating a courtyard where the entrance was located. When 23 Commonwealth was built ca. 1868, it had four windows in its western wall – two on the second story, one on the third, and one on the fourth – overlooking this courtyard. In October of 1880, Elizabeth Elliot (Torrey) Spooner, the widow of Daniel Nicolson Spooner, sold 23 Commonwealth to Eugene Van Rensselaer Thayer. On October 1, 1880, in anticipation of that sale, she entered into a party wall agreement with the estate of Samuel Hooper. That agreement stipulated that the right to retain the windows in the west wall extended to Mrs. Spooner and to Eugene V. R. Thayer, but would not be continued or extended to any other purchaser. The agreement also noted that, when 23 Commonwealth was built, the western wall, “by fault of the builders,” had been placed on 4 inches of the property of 25 Commonwealth, and that the division line between the two properties was actually 4 inches to the east. On November 10, 1885, 25 Commonwealth was purchased from the estate of Samuel Hooper by Oliver White Peabody, co-founder of the investment banking firm of Kidder, Peabody & Co. He and his wife, Mary Ann (Lothrop) Peabody, made it their home. They previously had lived at 105 Marlborough. Mary Ann Peabody was Thornton Lothrop’s sister. In the early 1890s, probably in 1890-1891, the Peabodys remodeled 25 Commonwealth, extending the eastern half of the façade so that it would be on the same plane as the western half, with an entrance at street level (the ownership of 23 Commonwealth had changed and the windows in its western wall therefore no longer were protected and could be covered by the new construction at 25 Commonwealth). A comparison of the 1888 and 1895 Bromley maps illustrates this change. Oliver Peabody died in October of 1896. Mary Ann Peabody continued to live at 25 Commonwealth until her death in January of 1911. On September 1, 1911, 25 Commonwealth was purchased from Mary Peabody’s estate by Alice Putnam (Bacon) Lothrop, the widow of William Sturgis Hooper Lothrop. Her deceased husband was Mary Peabody’s nephew, the son of Thornton and Anne Lothrop (who continued to live at 27 Commonwealth). He had been a banker in Puerto Rico, where he died in April of 1905. During the 1911-1912 winter season, Alice Lothrop was joined at 25 Commonwealth by her brother, banker and broker Louis Bacon. He previously had lived at 925 Boylston. He married in January of 1912 to Mary Rodman Sutherland; after their marriage, they lived at 15 Marlborough. Alice Lothrop continued to live at 25 Commonwealth during the 1913-1914 winter season, but moved thereafter and by the 1915-1916 season was living at Haddon Hall at 282 Berkeley (29 Commonwealth). During the 1914-1915 winter season, 25 Commonwealth was the home of Annie Lee (Allen) Chauvenet, the widow of St. Louis attorney Louis Chauvenet. 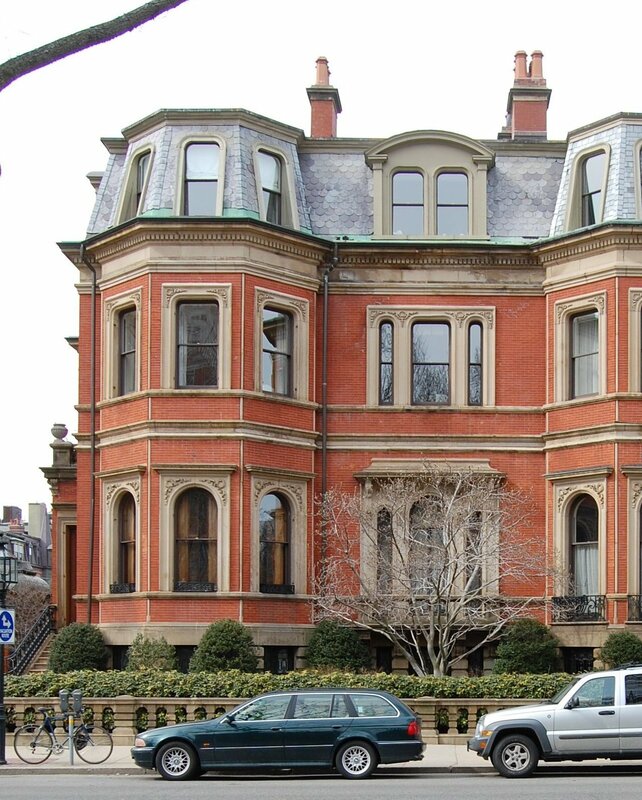 In 1910, she had lived at 20 Westmoreland Place in St. Louis, which she had built after her husband’s death in 1904. It appears likely that she moved to Boston when her son, Louis Chauvenet, Jr., reached college age. By the 1915-1916 season, she had moved to 180 Beacon. On October 29, 1915, 25 Commonwealth was purchased from Alice Lothrop by Miss Mary Shreve Ames, daughter of railroad investor Frederick Lothrop Ames. She had lived at her family home at 306 Dartmouth the previous year. She also maintained a home in North Easton. Mrs. Emma Isabelle (Jones) Sinclair, the widow of New Hampshire railroad investor Charles Arthur Sinclair, lived with her. Mary Ames served as president of the Massachusetts Anti-Suffrage Association. Mary Ames married in May of 1916 to Louis Adams Frothingham, an attorney, who had served as Speaker of the Massachusetts State House of Representatives in 1904-1905 and as Lt. Governor in 1909-1911 (in 1921, he was elected to Congress, where he served until his death in 1928). After their marriage, they lived in North Easton. On June 18, 1918, 25 Commonwealth was purchased from Mary (Ames) Frothingham by William Madison Wood. He and his wife, Ellen Wheaton (Ayer) Wood, lived at 21 Fairfield. William Wood was president of the American Woolen Company, which he had founded with his father-in-law, Frederick Ayer, and subsequently built into the largest woolen manufacturing firm in the United States. On July 12, 1918, William Wood transferred 25 Commonwealth to his son, William Madison Wood, Jr. He and his wife, Edith Margaret Goldsborough (Robinson) Wood, made it their home. William Wood, Jr., was a vice president of the American Woolen Company until November of 1919, when he resigned to go into business for himself. He subsequently formed the firm of Edington & Co., wool merchants. Before occupying the house, the Woods undertook major remodeling, including adding a rear ell, adding a story at the rear of the house, and installing an elevator. The remodeling was designed by architect William Chester Chase. A partial set of plans for the remodeling is included in the City of Boston Blueprints Collection in the Boston Public Library’s Arts Department (reference BIN C-59). The Woods lived at 7 West Hill Place while the construction was being completed, and took occupancy of 25 Commonwealth in about 1920. William Wood, Jr., was killed in August of 1922 in an automobile accident in Reading. Also killed with David Alexander Gardner, a passenger in William Wood’s car. He and his wife, Dorothy (Davis) Simpson Gardner, lived at 342 Beacon. Edith Wood continued to live at 25 Commonwealth during the 1924-1925 winter season, but moved thereafter. During the 1925-1926 winter season, 25 Commonwealth was the home of Arioch Wentworth Erickson and his wife, Cecile Rush (Macy) Erickson. They previously had lived in Swampscott, where they continued to maintain a residence. By the 1926-1927 season, they had moved to 142 Chestnut. On July 31, 1926, 25 Commonwealth was purchased from the estate of William Wood, Jr., by Robert Frederick Herrick. He and his wife Margaret Forbes (Perkins) Rice Herrick, made it their home. They previously had lived at 101 Chestnut. They also maintained a home in Milton. Robert Herrick was an attorney and bank director, and also a noted supporter of Harvard’s rowing program. Margaret (Perkins) Herrick was a leader in child care, social service, and juvenile justice organizations. In June of 1929, Robert Herrick applied for (and subsequently received) permission to extend the rear ell across the yard to the party wall and carry up it up three floors. The remodeling was designed by architect Charles H. Way. In February of 1931, Robert Herrick acquired 27 Commonwealth from the estate of Anne (Hooper) Lothrop, who had died in July of 1930. After acquiring the house, he appears to have left it vacant or, perhaps, to have consolidated it with 25 Commonwealth. Robert Herrick died in October of 1942. In his will, he left 25-27 Commonwealth to Massachusetts General Hospital (MGH), with a right to life tenancy at 25 Commonwealth for Margaret Herrick. She continued to live there until her death in July of 1968. In October of 1968, MGH applied for permission to convert 25 Commonwealth to a student and graduate nurses dormitory. The Board of Appeal granted the change, with a proviso that the use would expire in 1974. In 1974, MGH sought permission to extend the use, which was granted with an expiration date of 1981. In 1981, the use was made permanent. Samuel and Anne (Sturgis) Hooper lived at 25 Commonwealth from the time it was completed in about 1861. They previously had lived at 56 Beacon. By 1869, they had been joined at 27 Commonwealth by Samuel Hooper’s brother and sister-in-law, Nathaniel Hooper and Emma Lincoln (Bird) Hooper. Nathaniel Hooper had been an East India merchant and later became a commission merchant in Boston. Emma Bird was his second wife; they had been married in February of 1867 and then lived in France. Prior to their marriage, he and his first wife, Harriet Rose (Wilson) Hooper, had lived at 112 Beacon. Emma Hooper died in December of 1869. Nathaniel Hooper continued to live at 27 Commonwealth with Samuel and Anne Hooper in 1873, but had moved to 264 Beacon by 1874. 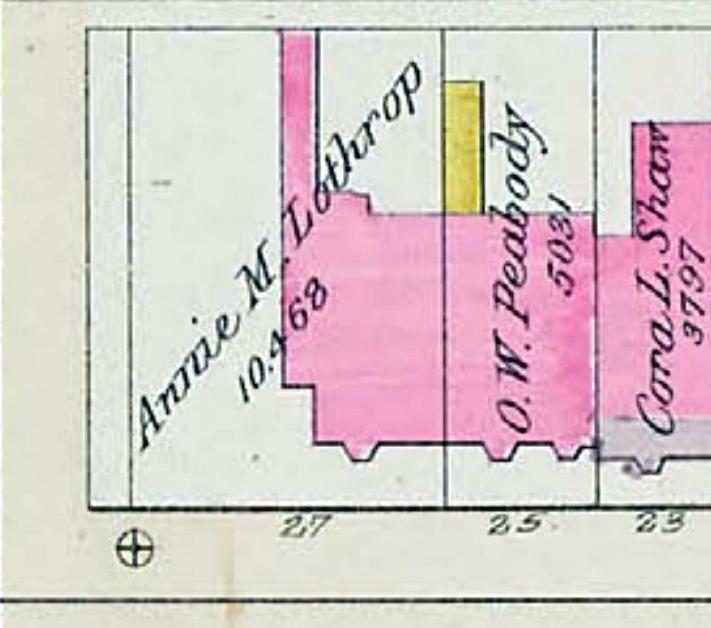 After his death, Anne (Sturgis) Hooper moved to 53 Beacon, and their son-and-law and daughter, Thornton and Anne Lothrop, moved to 27 Commonwealth from 25 Commonwealth, where they had lived since their marriage in April of 1866. During the 1882-1883 winter season, the Lothrops were living elsewhere and 27 Commonwealth was the home of Richard Cowell Dixey and his wife, Ellen Sturgis (Tappan) Dixey. Richard Dixey was a former music teacher and pianist. The Dixeys later also maintained a home in Lenox, Tanglewood, the former property of Ellen Dixey’s family, which she and her unmarried sister, Mary Aspinwall Tappan, inherited. 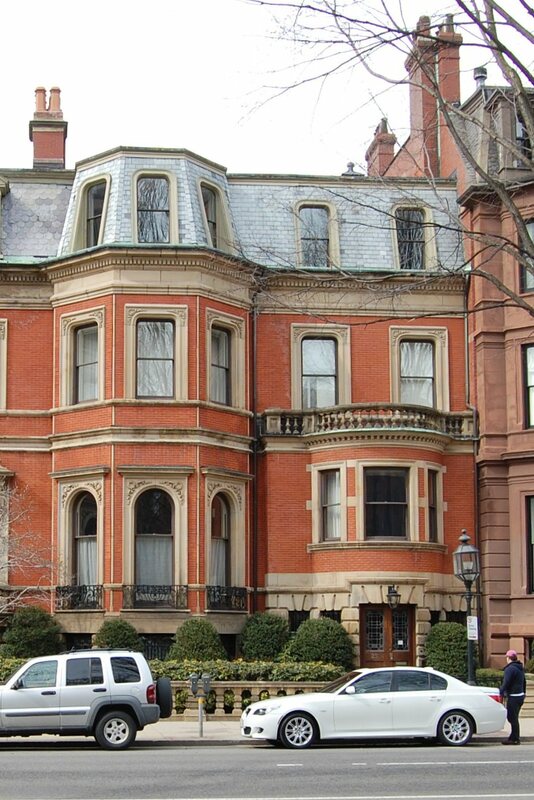 In 1937, Mary Aspinwall Tappan and Rosamond (Dixey) Brooks, who married Gorham Brooks in June of 1913, donated the property to the Boston Symphony. On February 25, 1885, 27 Commonwealth was acquired from Samuel Hooper’s estate by Anne (Hooper) Lothrop. Later that year, In November, 25 Commonwealth was acquired from Samuel Hooper’s estate by Oliver W. Peabody and his wife, Mary Ann (Lothrop) Peabody, who was Thornton Lothrop’s sister. During the 1890-1891 winter season, the Lothrops were living elsewhere and 27 Commonwealth was the home of Mary (Vinton) Clark, the widow of Randolph Marshall Clark, who had been treasurer of the Boston Elastic Fabric Company. She previously had lived at 283 Commonwealth. By the 1891-1892 season, Mary Clark had moved to 139 Beacon and the Lothrops were living at 27 Commonwealth again. 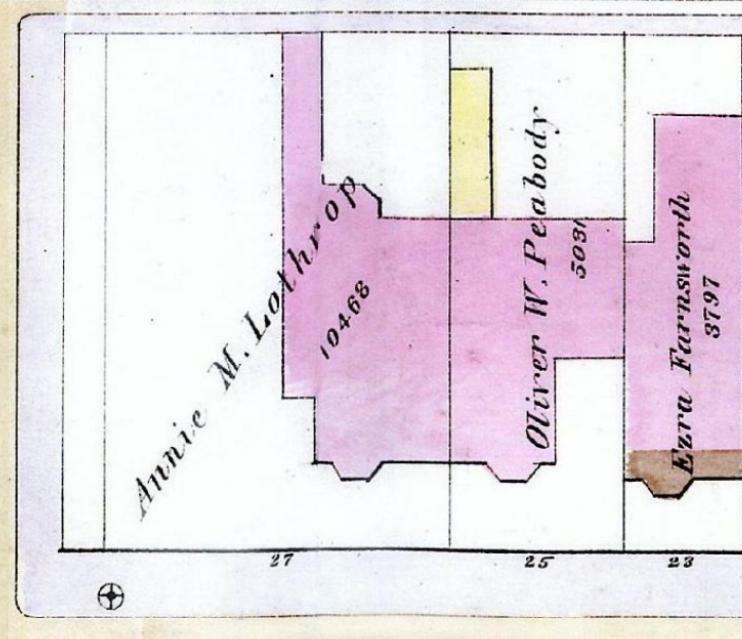 On June 25, 1898, Anne Lothrop transferred 27 Commonwealth into her husband’s and her names. Thornton Lothrop died in November of 1913. Anne Lothrop continued to live at 27 Commonwealth and also maintained a home in Manchester. Anne Lothrop died in July of 1930. On February 13, 1931, 27 Commonwealth was purchased from Anne Lothrop’s estate by attorney Robert Frederick Herrick. He and his wife, Margaret (Perkins) Herrick, lived at 25 Commonwealth. After acquiring 27 Commonwealth, it appears that they left the house vacant or, perhaps, consolidated it with their home. 27 Commonwealth no longer was listed in the Blue Books after 1931 and was shown as vacant in the 1932-1941 City Directories. 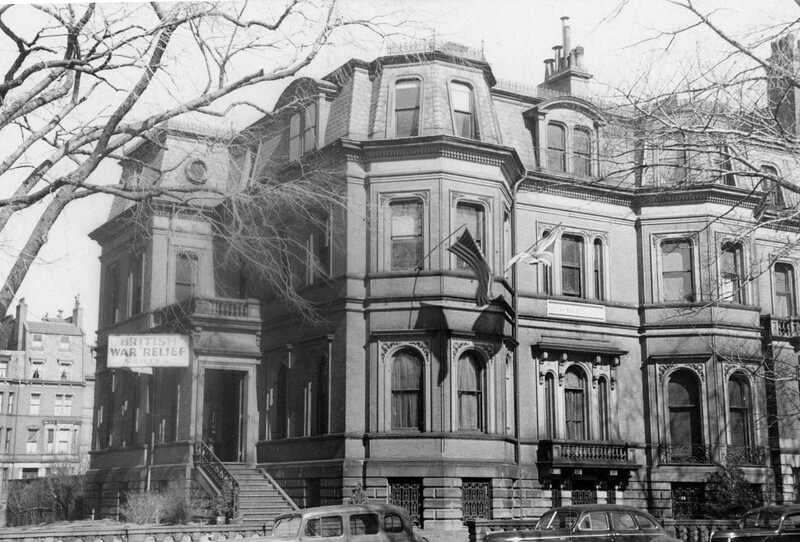 By the spring of 1941, 27 Commonwealth was the “uptown headquarters” of the British War Relief Society, lent to the organization by the Herricks. On September 15, 1942, what the Boston Globe called a “crude time bomb” was exploded at 27 Commonwealth, breaking windows but causing no injuries. The Society continued to be located there in 1944, and probably until the end of the war. Robert Herrick died in October of 1942. In his will, he left 25-27 Commonwealth to Massachusetts General Hospital (MGH), with a right to life tenancy at 25 Commonwealth for Margaret Herrick. In December of 1943, MGH applied for (and subsequently received) permission to convert the property into a dormitory for nurses. 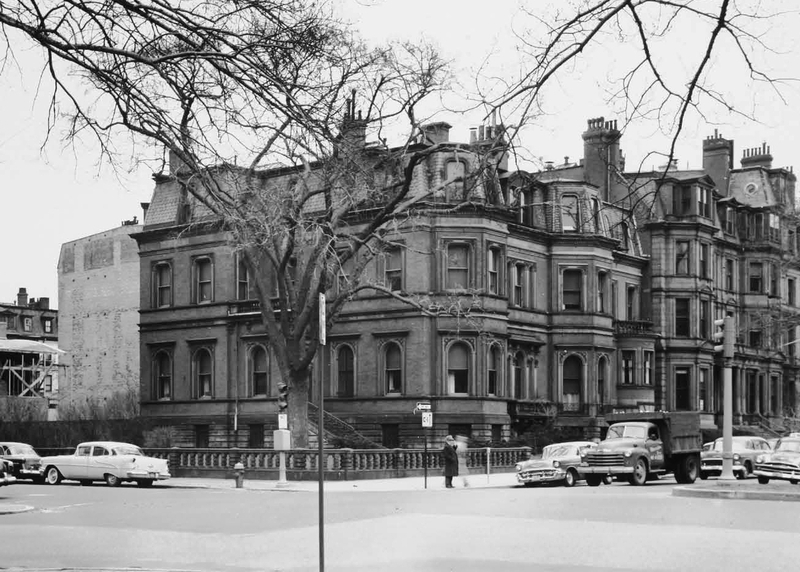 On September 30, 1980, Massachusetts General Hospital transferred all of its real property in Boston and Chelsea to the General Hospital Corporation, a non-profit corporation formed by the hospital to manage its assets. In March of 1983, the hospital filed for (and subsequently received) permission to convert 25 Commonwealth from a dormitory into a single-family dwelling, and in March of 1984, it applied for (and subsequently received) permission to convert 27 Commonwealth from a dormitory for nurses into a lodging house for the parents or guardians of medical patients. On February 29, 1996, 25-27 Commonwealth were purchased from the General Hospital Corporation by the 25-27 Commonwealth Avenue LLC (Richard A. Marks and Allan W. Rottenberg, managers of record). In May of 1996, the 25-27 Commonwealth Avenue LLC applied for (and subsequently received) permission to combine the two houses, convert them into four units, and install a nine-vehicle subsurface garage. On March 12, 1997, it converted 25-27 Commonwealth into four condominium units, the 25-27 Commonwealth Condominium. On the same day, the 25-27 Commonwealth Avenue LLC also entered into a conservation restriction agreement with the Friends of the Public Garden to ensure that the garden on the Berkeley side of 27 Commonwealth would remain open space in perpetuity.